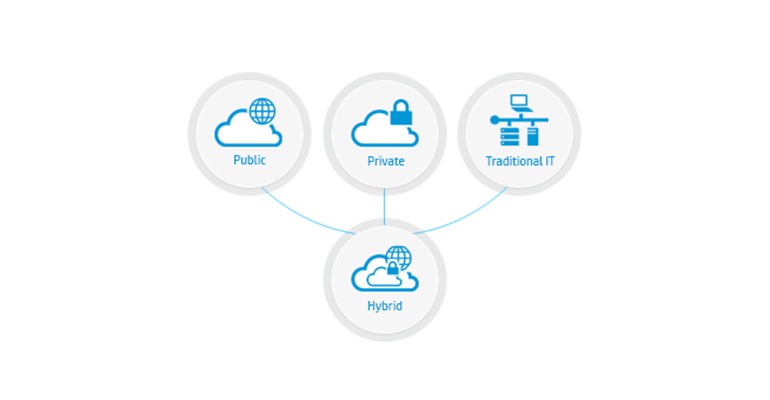 An integrated Cloud service that makes use of public cloud and private cloud in order to perform different and special functions in a given organization is called a hybrid cloud. The different cloud services offer different efficiencies. When we consider the public cloud they offer more cost effectiveness when compared to the private clouds. So, ideally, a perfect combination of the clouds will ensure that there is seamless integration. In short, hybrid cloud is nothing but, private cloud and public cloud put together with the dedicated servers so that all work in tandem as a single system. You will understand better when you try to get down to the fact as to why the hybrid cloud is better when compared to the singular counterparts. Let us take a closer look: Rather than force fit your applications in a specific deployment model or economic model, with the help of hybrid approach you will be able to tap the benefits of each of the services. You could get a custom fit that is high on performance solution and also efficient enough to meet the business needs you have on hand, regardless of whether it is a business need or technical need. You will get a custom fit for your application rather than forcing the application to fit into the model. You will be able to meet the reliability, security and performance parameters with ease. Mitigate costs when you use the right economic model and incorporate the agility and variability requirements. You are assured that you are employing the perfect tool for the job on hand. Rest assured that the hybrid cloud model will bring in the right choice so that it can accommodate the requirements of the application and facilitates better growth of business. When you are using this hybrid cloud solution, you can be assured that you need not have to re-architect the application to fit a specific cloud. A few applications, the transition may be simpler when they are moved to a virtualized or a dedicated environment. Experienced IT companies understand perfectly well that public cloud may not be the perfect choice for all kinds of applications just the way on premise or dedicated is also not the perfect choice for all applications. When you are using the hybrid cloud, it will facilitate your application to run where it is best supposed to run, thereby giving only the best of performance, security and reliability coupled with economics too. When you are making use of the hybrid cloud option, you are getting all those benefits that are a part of the open source platform…not to forget the versatility and flexibility. The user also has the freedom to move his cloud to the environment that best fits his requirement. Why Choose Weberloo and Rackspace for your Hybrid Cloud solution? When you choose hybrid cloud service from us, you can be assured that you are getting the best fit architecture for the specific application you have on hand, which meets all the business requirements. This hybrid solution is bound to meet all the benefits that a public cloud, private cloud and a dedicated environment would bring along. As we are a name that is reckoned with best of practices, the best of architectural advice and offer great service in application monitoring, we consider ourselves the best choice for your business needs. We have garnered a whole lot of experience in deploying hybrid clouds and will leave no stone unturned to make your applications run perfectly. Another huge advantage that you are going to get with our service is that you can get fanatical support from our end…which means support extended 24x7x365 days. Businesses have been yearning to have such a cloud since a long time. It is high time that business owners gave up the one-size fits all models and got hold of a custom model for their business. As we have carved a niche for ourselves in the field, you do not have to accept any kind of trade-offs. Stop going in for public clouds as there are numerous hybrid clouds wherein you could fine each one specialized for a specific application. Hybrid Cloud is the most happening thing and helps you to stay ahead of competition.